A still frame has been released featuring Johnny Depp wearing coloured contact lenses as part of his makeup as the Mad Hatter in the forthcoming Alice in Wonderland film. The image from director Tim Burton"s adaptation of Lewis Carroll"s book sees the actor in stunning makeup, standing before a backdrop of dark clouds and a line of soldiers. Screencrave.com writer Mali Elfman believes that this is the first time that the use of coloured contact lenses  which have been used recently in films such as The Twilight Saga: New Moon and The Men Who Stare At Goats  has been mastered. He wrote: " I"m pretty sure that these were done in post-production not in the actual shooting of the film, but if that"s the answer, someone tell the people on Eclipse before I have to watch them walk around in more horrible contact lenses again!" 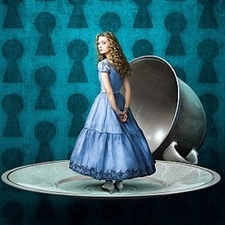 The film stars Mia Wasikowska as Alice along with other big names including Matt Lucas, Stephen Fry, Michael Sheen, Helena Bonham Carter and Alan Rickman, and is to be released on March 5th 2010.